The Mauna Loa CO2 curve fits the cumulative emissions curve to a remarkable degree. And not only did I replicate/confirm (and provide a scale to) the fit, but to my complete surprise, I found, in the maths, a theoretical absorption constant for CO2 that works hand in hand with the cumulative emissions curve. Both levels of "fit" are very high, one might say, seductively high; the "absorption constant" at 16.4% per decade, and the CO2 rise with a fixed rate of 57% of the cumulative emissions. .........the problem is the 16.4% per decade low level of absorption of just our emissions - needed to make the cumulative emissions curve fit the CO2 curve. 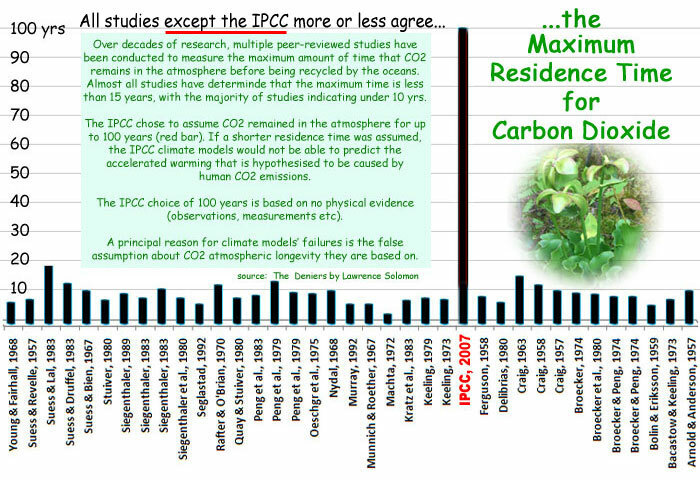 This slow absorption / long residence is ridiculously far off the scale of all the many studies done from 1957 to 1992 to show the average time CO2 stays in the atmosphere before reabsorption in the natural cycle. 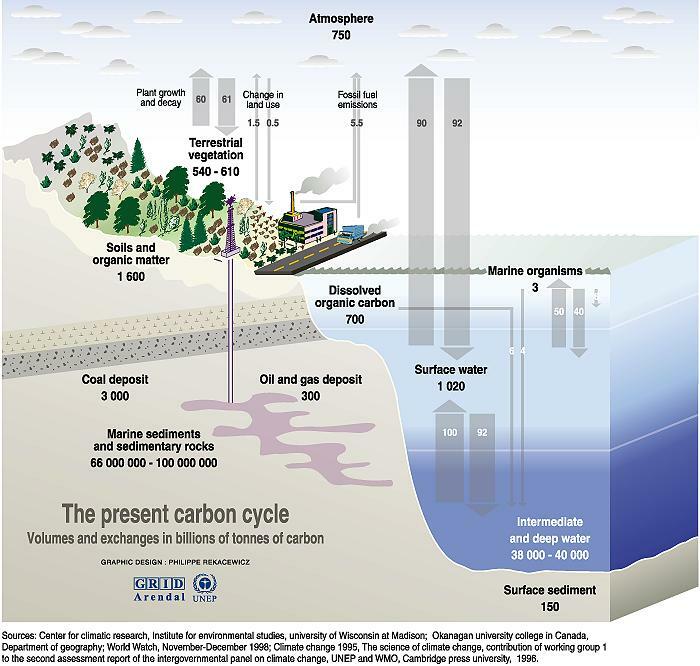 As to separating out natural CO2 from manmade CO2 - ridiculous. There have to be natural factors at work. Recent global warming must have caused at least some of the CO2 rise. Yet we have this weird mathematical coincidence that shows CO2 annual atmospheric rise has stayed at almost exactly 57% cumulative emissions. 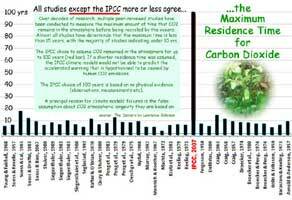 I believe that this weird 57% coincidence is the reason IPCC promoted the "100-year residence time" which covers the 16.4% absorption per decade needed, if one is to continue to blame emissions. 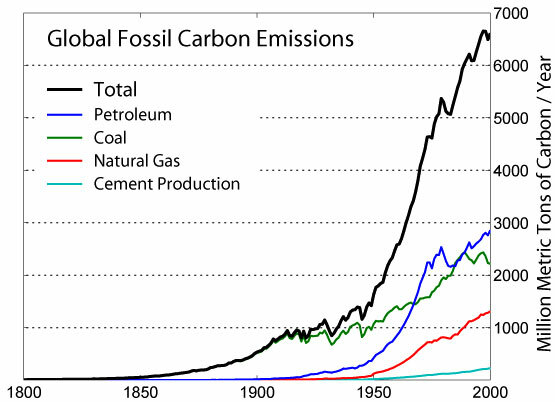 CO2 emissions were measured for 1964 and 2004, from the CDIAC graph for the years 1950 to 2008. Increases of CO2 atmospheric levels were measured from the slope of the Mauna Loa graph in 1964 and 2004. Then the ratios of annual increase : annual emissions were calculated as percentages for 1964 (57%) and 2004 (47%). If the CO2 increase were due to our emissions, and due to the earth only being able to absorb a certain proportion, but the CO2 turnover is relatively fast as all the studies say, my expectation was that the annual increase/annual emissions percentage in 2004 would be roughly the same as, or higher than, that of 1964. But the proportion is lower. Strangely, however, the 1964 annual increase/annual emissions percentage is 57%. To test the fit between cumulative CO2 and atmospheric CO2, I defined the cumulative CO2 quantity as a geometrical approximation of the area under the CDIAC graph, and calculated by simple arithmetic the totals for 1950, 1960, etc through to 2010 (a tiny extrapolation). The figures obtained were plotted on the Mauna Loa y-axis, using 57% and measuring in ppm (divide GT by 2.13). These figures were found to fit perfectly scale-wise. This proved two things (1) my measurements were accurate enough (2) the Mauna Loa red line is indeed the curve of 57% of cumulative emissions. With this fit, the emissions calibration was drawn as a second y-axis scale (red), and proved to be displaced from the CO2 concentration scale by -293 ppm (but at the same scale). But what does this 57% represent, outside a mathematical theory-box? Presumably the idea is that 43% emissions are absorbed - but how to figure that? it sounds suspiciously like a static figure, whereas we have a dynamic situation with CO2 sequestration. So I built a table, Model no.1, using both the decade's emissions (column A) and the cumulative emissions (column E) for each decade from 1960 to 2010, and starting with a century's known accumulated 65 GT in 1950, of which I clearly had to find 57% to get the hypothetical residual atmospheric amount ie 37 GT. The known 23 GT emissions for the decade 1950-1960 was added to this hypothetical atmospheric residue to give 60 GT. The actual cumulative emissions in 1960 are 88 GT, of which 57% is 50.16 GT. Now 50.16 GT is just 83.6% of the 60 GT (hypothetical residual + known decadal) emissions. If a natural absorption process is being represented, one would expect the decadal percentage absorption to remain constant. Using 83.6% residue (16.4% absorption) per decade, I multiplied each decade's residue + new emissions by 83.6% and compared the results with the known cumulative emissions. The residual figure does indeed stay very close to 57%, quite within the bounds of the accuracy obtainable here. Being aware of the huge annual turnover of CO2 compared with our emissions (which are around 1/30 of the annual turnover or 1/100 of the atmospheric total) this result did surprise me. I know the ability of the biosphere to bloom in response to extra food, to take hold of extra available CO2; and with such a huge turnover, such capacity to absorb seems as if it should be a natural. Nevertheless, the rising CO2 level has a strong correlation with this hypothetical fixed absorption figure of 16.4% per decade, and this is weird, to say the least. Since I still think that part of this must be due to recent temperature rises, I tried a second "suspect model" whose figures allow for natural warming CO2 increase alongside emissions CO2 increase. Here I've calculated the figures for a hypothetical "natural" CO2 rise factor that is 51.5% of the cumulative emissions total; the hypothetical "emissions residue" is now 5.5% of the cumulative emissions (this being the difference between 57% and 51.5%). Using the much higher absorption rate of 80% per decade, this leaves just 20% to be calculated from the decade's residue (now quite small) and the decade's emissions. In formulas, Hn = (B1+B2+...Bn); G1 = 57% x H1; F1 = 51.5% x H1; E1 = 5.5% x H1; C2 = D1 + B2; D2 = C2 x 20%. I used column E to check the "fit" of column D figures, and with fudging, got a fit good enough to make the point. Row No. Decade end date Decade's emiss. 20% -> residual atmos. emiss. decade's warming (51.5%) Atmos. incr. We've lost the simple pattern of model 1, where CO2 (ppm) = cumulative emissions x 57% - 293. I took the hypothetical "natural" warming figures as a constant proportion of emissions. This means that the "natural" CO2 numbers are now very arbitrary. Nevertheless, there must be a natural factor - planetary warming must have increased CO2 levels through outgassing oceans. But the natural factor has weirdly dovetailed with the emissions pattern to produced a CO2 levels curve that fits the cumulative emissions curve very closely, and also fits a constant absorption rate, but leaves no room for CO2 produced by warming. One wonders just what strange cosmic powers could be at work to produce such a mathematical riddle. Of course, I still do not believe that the increasing CO2 has any significant warming power, or that any warming due to CO2 would be anything but beneficial on balance. But I do now wonder if a significant part of the increase could be due to our land use changes. At best, rising CO2 gives a lot more potential for food. But at worst, if the CO2 rise has been due to temperature rise, and if levels slump with a colder planet, we may have food problems. And if supplies of carbon fuels (whether fossil or no) are limited, we should do out utmost to balance supplies available with population, and do this without using alarmist techniques or bad science. We need a science that shows more integrity and realism, and openness to debate, than that displayed so far by the IPCC, the alarmists, the science institutions, and business interests. We need a climate science which everyone can understand sufficiently well to spot gaffs and cons. We need transparency of methods and data, clear language, and a situation where participation by lay scientists is welcomed. I'd be delighted if anyone can check or improve my figures.